Martha and Jonathan eloped at the San Diego Courthouse on a sunny Monday afternoon. These two lovebirds are super adorable and brought some personality to their elopement. I love all their pirate-inspired wedding details- right down to the skull and bones nail design on Martha’s toes! Martha looked absolutely amazing on her big day, sporting diamonds and pearls as her very classy bridal accessories. She carried a lovely unconventional bridal bouquet made of cloth flowers. Everything came together perfectly for a romantic elopement on the San Diego bay! 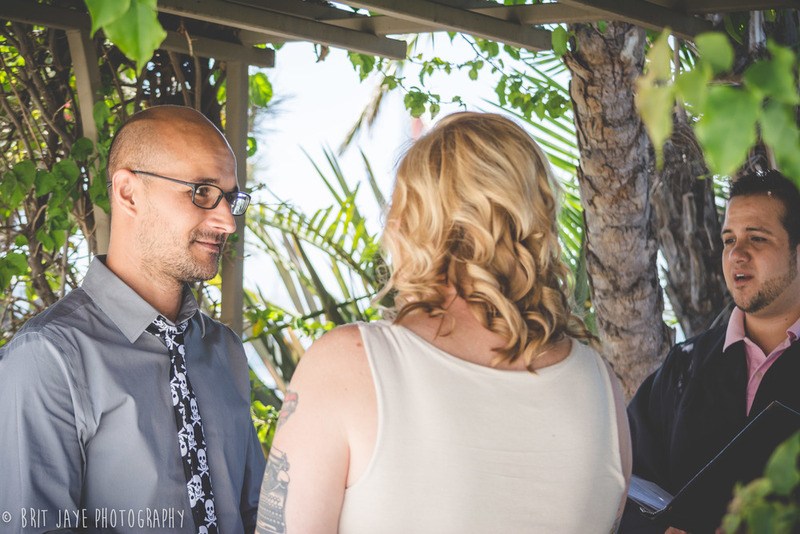 These two tied the knot at the gorgeous outdoor ceremony location at the San Diego Courthouse. They said ‘I do’ under a gorgeous garden arbor in front of the San Diego bay. I mean really, in my opinion, San Diego is the best place to elope! After everything was sealed with a kiss, we crossed the street to take some photos next to the water. The Star of India was the perfect backdrop for some bridal portraits! Congratulations Martha and Jonathan! Wishing you the happiest ever after. Enjoy all the beautiful moments from this San Diego Courthouse wedding! For information about booking- contact me!